Martin & Sandra came & picked me up around 8:30 p.m. to take me to one of Sandra’s favorite hangouts from her university days. 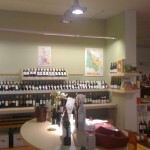 It’s a wine & cheese bar around the corner from the U of Frankfurt, & it’s located in a cozy cellar lit mostly by candles. My kind of place. We sat at a communal table, meaning there were other people seated at the same table as us, having their own little ‘date’ & going about their own evening. This is a pretty common practice (sharing the space) here, though it wouldn’t fly at home. I mean really, sharing a table with a stranger? Who does that? :) One might even make a new friend. Had a chance to catch up with Martin & Sandra over a Spanish Navarra red wine; it reminded me of a great zinfandel. Martin ordered us pretzels (yes!) & a vorspeise (appetizer) plate that came with hummus, bread, sun-dried tomatoes, some white beans (don’t know what they were but they tasted good,) black & green olives, parmesan cheeze, & some salami. Ahh. Interesting talks about our kids – their oldest daughter, (2nd grade) is facing some pretty tough stuff right now & has a classmate who is seemingly well-versed & connected in the occult; her mom is a practitioner of the dark arts. Sandra & Martin were trying to figure out what they could do to address the situation; they can’t just forbid their daughter from seeing the classmate because they can’t move her out of that class. So, we talked about praying for our kids & “blessing & cursing” – speaking life, God’s protection, & physical/spiritual covering over their daughter; basically taking a firm stand in the spiritual world. The night was over way too quickly, & they dropped me off around 11, just in time for me to crawl under the covers & go to sleep. 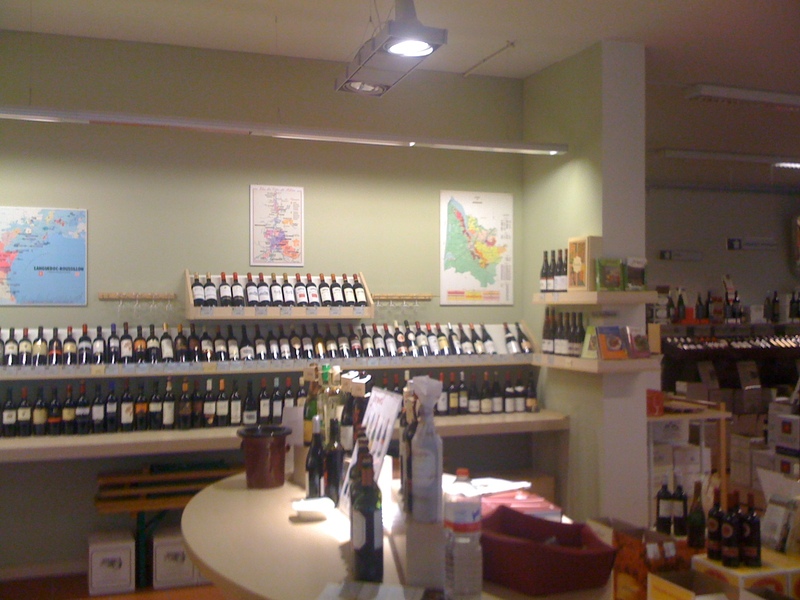 I’ve walked Leipziger Strasse at least 100 times in my life – never have I seen what I saw today: Jacque’s Wine Shop. 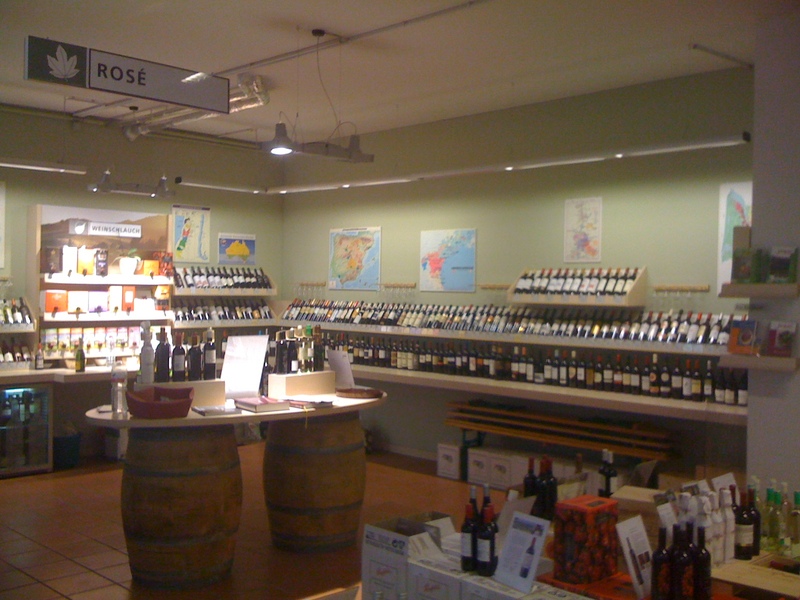 I stumbled into it & found a collection of wines from all over the world… except the USA. I’d been planning on going by the Aldi or the Penny Markt, to buy wine for Julia’s family for when I see them on Saturday, but Jacque’s provided a better alternative with a great selection. 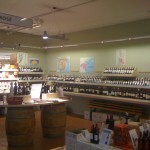 The pictures don’t do the store justice, but I think I was making the proprietor nervous. I know one of the other customers just about lost it when I pulled my phone out to take pictures. He gave me the Look of Doom, & shook his head at me just like my old German teacher Frau Carson used to do in order to show her displeasure at my inability to put the verb in the right place in the sentence. Ah, dear Frau Carson, I do miss thee. Ended up getting a Spanish Tempranillo/Crianza for Eddy & Laura, & an Italian Primitivo for the family Kern. I could have spent a couple of hours (& a couple hundred euro) in Jacque’s but alas, I needed to get home so that I could study for my speeching on Saturday & Sunday. Spent the afternoon/early evening going over my notes for “Foursquare Friends Day” – a multi-church celebration in Engstingen where I get to share ‘my heart’ – meaning what I believe is important & close to God’s heart. I’ll be talking at least 2 times (about 45 minutes a shot): the first will be about the Monday Morning Church; the second is about living the Spirit-filled life… which is HOW we live as the Monday Morning Church in the 1st place. The time flew by, & I ended up studying for several hours… it got dark & the rains came again. But by the time I finished my studies, I needed to get out & walk – so I did, rain & all. The rain & cold have left my right knee achy, especially where the screw from my ACL repair goes into the bone. Had coffee & prayer with Eddy, then we headed over to the rooms that TPLF had rented for the “Revolution of the Soul” seminar – it was truly a great space in a phenomenal building. It reminded me a lot of the building in “The Office” episode where Michael falls into a koi pond. Because it had a KOI POND Booyah. Major excitement from This Guy. The seminar went well – I told my own story of God’s dealing with me about the Sabbath. Talked about being thankful & content. The affect of adrenaline & stress on the body, & the built in need for rest we have. The talk about adrenaline & stress probably got the most response – it seemed that many had never really heard how our bodies work – that when we have a ‘high demand’ time where we produce a lot of adrenaline to meet the demand, it’s followed by a ‘low time’, which is our bodies natural resting & restoring property – though during the rest & restoring time we usually feel “blah.” Irritated. Down. Like something is ‘off’. And all it is is the ‘normal’ process that our body uses to heal itself. It just feels so different from the ‘on,’ adrenalized, up version of us that it feels something is wrong. With Christians it can be worse, because in the down times, we think something is wrong with us, & that we’re doing something wrong. So we try harder to ‘get right’. Pray more. Read more. Do more. Thinking that it will cause our ‘low’ to turn around. One lady shared with tears in her eyes that for the first time she realized something WASN’T wrong with her when she experienced her post-adrenaline lull. That it was just her body recovering. I had a lot of fun today, in part because the majority of people there were from TPLF &/or were people I’ve known for many years. It was very gratifying to be able to share with others something that God has used so powerfully to work inside of me. Also, dear Julia! who lived with us for almost 6 months, drove for 2 hours from her home to be there. I love that girl. What a special treat! At the end of a long day with way too much of me talking, I am spent. Looking back, I would do things a lot different today, most notably have more opportunities for people to interact amongst themselves. Still, it went very, very good. Eddy was on his way to a kindergarten party, so he dropped me off at the house. I Skyped the beautiful Bean, (I miss that woman!) & then made my way down the street to the corner Pizza Parlor for a pepperoni & pineapple pizza with a dunkleweizen. Ahhh. Life is beautiful. Tomorrow is church with our TPLF family. I can’t wait. Laura made pancakes, Eddy-style, meaning they were filled with almonds, apple, & coconut. I ate to my hearts’ content, using syrup, Nutella, & apple marmalade as toppings for different rounds of pancake-ery. Good times. The coffee was excellent as well. Woke up in time for lunch, which was raviolis. Eddy & family headed off to a birthday party & I set myself for an afternoon of solitude. Which is my favorite. 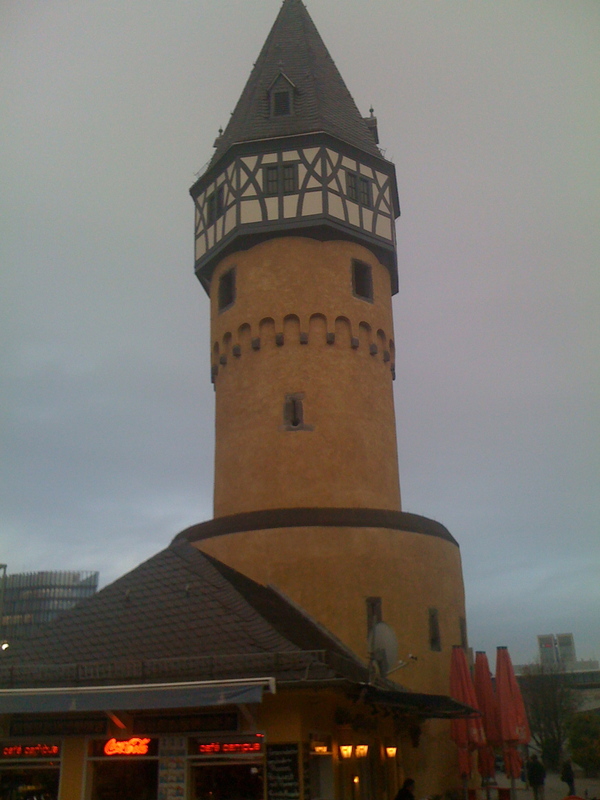 Read & dozed for a bit, then decided to head towards the city, through Bockenheim, which is where the church is located. Walked past the White Tower, which is located near the university. 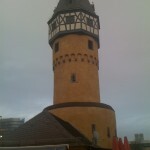 It used to be a watch tower, a line of defense for the city of Frankfurt. Made my way past the familar cafe’s & university dorm-style apartments towards the city center. 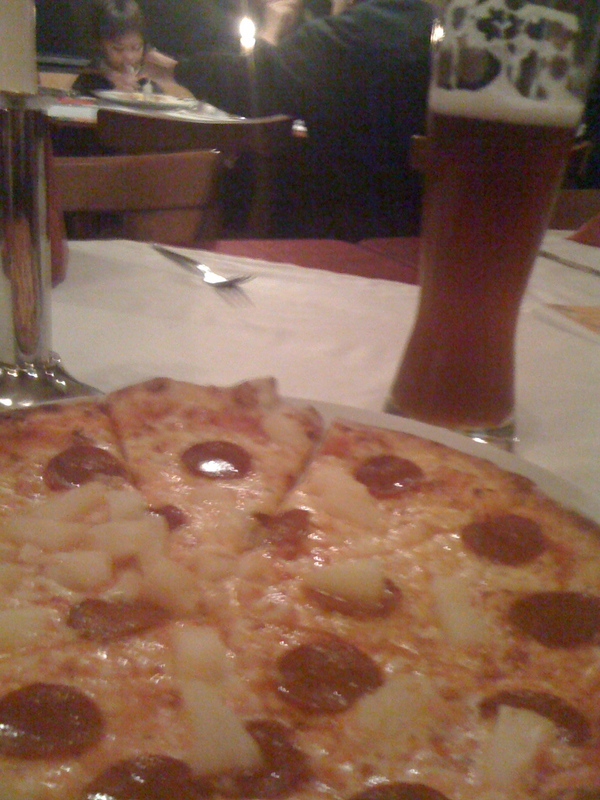 It was quite a ways away… further than I’d remembered, which is funny, because I usually take the U-bahn downtown. And now I remember why. 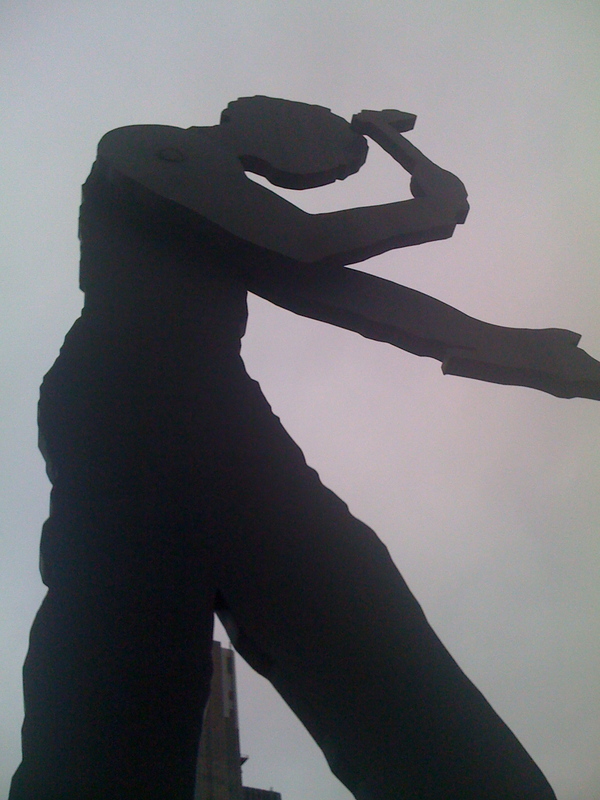 This is the “Hammering Man” – he symbolizes the 24/7 work ethic represented within the city of Frankfurt. He’s about 45 feet tall – makes me think about the Sabbath & the need for rest. (Probably because this is where God first ‘convicted’ me about my own work-a-holism…) To me, Hammer Man stands for the worst parts of humanity, Western Civilization & how we so easily work ourselves to an early grave, valuing each other only based on what we make or produce. 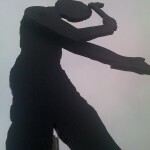 I know its just a sculpture, but it stands out in my mind as a symbol of what God has rescued me from. It also makes me think about tomorrow – I’m giving a presentation called, “A Revolution of the Soul” on the topic of living life in all its fullness; talking about rest, life rhythm, & the Sabbath. I have butterflies in my stomach just thinking about it. :) Truly, God’s work in my life in this particular area has been one of the most impactful things that has ever happened to me, & the thought that I get to share what He’s done in me, & what I’ve been taught & what I’ve learned brings tears to my eyes. Sometimes I get weepy. It happens. Came home from my walk just in time for pizza & movie night with Eddy, Laura & the boys. Then to bed early so I can get good rest & be ready for the day tomorrow. a series heavy sighs, or wondering how many times I dance this dance? And so I find myself to be spent; physically, emotionally, & relationally. Spent. Done. Finis. In need of a ‘hit the alarm 2x in the morning,’ followed by a 2 p.m. nap. And to bed early. I’m not scratching my head, wondering, “What happened?” I know exactly. I went to Sacramento the week of 9/13 for our fall pastors conference. Great conference. Fun with friends. Challenging speakers. Meaningful interactions. Late nights & early mornings. Came home, hitting the ground running to catch something that could not be caught: Monday & Tuesday – they were long gone. Jerry came in Friday, & I spent the weekend trying to spend as much time hanging out, talking with him as I could. And Friday/Saturday, I managed to shoehorn in a wedding rehearsal & wedding, a gathering & hang out on Saturday morning with Jerry & some friends, another gathering Saturday evening, & a full Sunday. Which was my birthday. Ended the day with packing… cause I had to catch the first flight out on 9/20 to Burbank for special meetings… in which I sat on a ballroom chair for a total of (drum roll please…) 21 hours over the course of Monday – Wednesday morning. Rushed home for round 3 of a special Marriage Enrichment series (which I’m loving, btw,) & staggered to bed. We’re hosting friends, a family of 4 Germans from Mainz, Germany through Friday 10/1. NOTE: this is not a bad thing to have & to host friends. But it does take it out of you. Did a Quincenera Saturday – absolutely wonderful time. Church on Sunday. Home & slept for 3 hours in the afternoon. Oh goodness. Still trying to catch up. Heavy sigh. Throughout the madness, theBean mentioned to me once or 30 times that this pace wasn’t ok. That my sabbath day of rest & recharging wasn’t getting the priority & attention needed. That the schedule I was keeping was… wrong. Too costly. Heavy sigh. At some point I gave at least mental assent to what she was saying, then hurriedly justified the 2 week sprint as “fun” or “mostly fun.” She wasn’t buying it. I’m not either. Today I spent time in repentance, embracing a change of mind, asking God’s forgiveness for the pace I’ve been functioning at. I know better, but it happened anyway. And I’m paying the price. A small part of me is questioning my ‘toughness,” as though if I were just BIGGER-FASTER-STRONGER this wouldn’t have happened, & I SHOULD’ve been able to make it through this, kicking the calendar & schedule’s proverbial butts, taking their proverbial names. Heavy sigh. Then I realize this small part of ‘me,’ isn’t me after all… its the enemy of my soul. The one who wants to steal, kill, & destroy. To poison & drain the very “life in all of its fullness” Christ came to bring & give. Hmm. Duly noted. Heavy sigh. On that note, I look at my calendar & see I have 34 days until I’m off to Frankfurt – November 3 -16. And the schedule there is full-ish, but I have some downtime intentionally included in the travel schedule. Praying for wisdom. Aiming for balance. Staying on rhythm. Heavy sigh. I might fall down, but I’ll get back up. Pasty is dominating his college schedule, passing all tests with flying colors. And getting A’s, which is better than colors. His girlfriend from Tennessee is coming to visit in just about a week. We’re so excited, we just can’t hide it. There I times I have to literally refuse to get offended… to not be antagonized by someone else’s (real or perceived) actions, words, slights, condescensions, etc. My anger & indignation rises up… & I realize that at that very moment, I’m thinking an awful lot about me. ME. And goodness, am I of primary importance? Oh yes. Heavy sigh. …this work week is only 3 days long, due to the impending Thanksgiving holiday. The bad news is… there’s still just as much to be done as is in a normal work week, but with 2 days less in which to accomplish it. So the only sane & right thing to do is… to downsize the work load for the week. In a marked departure from what I would have done just a few short years ago, I will intentionally do less, & aim to ‘walk life’ at a leisurely pace. Rather than try to pull off 3 marathon days in which everything I can think of doing is crammed into a 30 hour span, I will do what I can… prioritize & finish the “Have to’s;” delegate what can be delegated. Put off til next week the stuff that can wait. Then, I can enjoy the time off, be thankful for what God has provided for me, & truly BE present, emotionally, physically, & mentally for the food, football, family, & friends. And that is something that I can be truly thankful for. On the same drive, we saw Bo & Luke Duke, as well as the General Lee, sitting outside of Cooter’s Garage. ’nuff said. Went to the Salem Avalanche game last night – the “Salem Men’s Choral Group” – old guys in their 80s & 90s, in tuxes – sang the National Anthem, which was cool. The best part was that they walked (& walk-ered) onto the field to GNR’s “Welcome to the Jungle…” Truly. Being able to lead oneself is imperative for personal & relational growth… Knowing what to say “Yes” & “No” to. Not living by my whims, taking on a victim’s mentality, blaming others for my issues, choices, etc. “Leading oneself” might also be called self-control, self-discipline, self-governing, self-boundaries… & it’s not a rigid, militaristic way of life, but is a “fruit of the Spirit” way of life. Feeding my soul is necessary for life in its fullness. Feeding the soul of my relationship with theBean is necessary for that relationship to thrive. If I don’t stop & grieve, I can’t grow. This means grieving where I’ve experienced loss: death, of friendships, unfulfilled dreams, hurts, disappointments, friends moving, etc. My observation is that we (Americans) & we (the American Church) don’t grieve much. Or well. Jesus is more concerned with me, the person, & in the process I’m in, & how I “play with others around me”, than in anything I could ever do, any role I ever fulfill, any output or accomplishment that comes from my life. There are things that I would still be doing/living even if I didn’t have the job I have; remembering that, & trying to stay congruent by ‘doing/living’ those things now, is something I’m pondering. I have a couple of travel uniforms – meaning, I wear the same pants & shirt… funny, but comforting. My ‘new’ jeans. White T. Sweet black support socks (to keep the blood flowing instead of pooling in my feet.) Blue polo. Comfy black slip ons. My 1 belt. Yeah. It’s all laid out, right now, ready to go. Only 24 hours & I’ll be on a jet plane with my girlfriend, coming back to my family. And the life that I love. And am thankful for. Sigh.